Philippines is truly a banana republic. And why is this so? Well because of tons of banana varieties we can find in the market and the delicious recipes that goes with it. And when we speak of bananas nothing beats a delicious miryenda of Banana-cue. Do you know that Bananas are one of the oldest cultivated plants. They are native to South and South East Asian region. No doubt the use of bananas is exuberant in this part of the world. Bananas grow almost everywhere in the Philippines whether cultivated in the garden or widely in the nature. The banana blossoms are ideal for cooking as vegetable, taste like artichokes while leaves are used in wrapping and for cooking. When I was growing up, I always admire these single mom neighbor of us who raised all her children by selling banana cues in neighborhood. 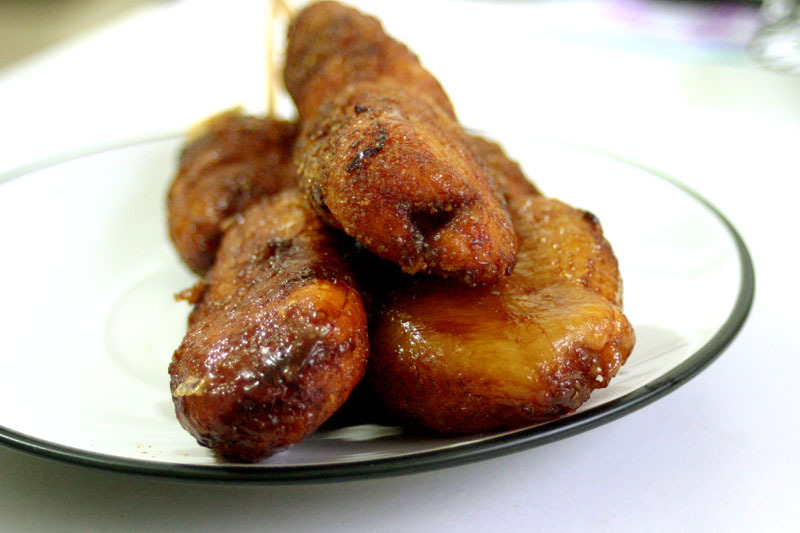 In honor of her hardwork and love for her family I am sharing this delicious and authentic banana-cue recipe to die for. Peel your bananas. Heat your deep frying pan with half a liter of oil. Once the oil becomes very very hot, put gently all your bananas (it depends on the size of your frying pan). Cook your bananas by mixing them constantly, after about three to five minutes add your brown sugar. It will melt and caramelize. Continue mixing gently the caramel and the bananas. If you wish a caramel well melted on your bananas, you can continue cooking this for about five more minutes. Or should you prefer a crunchy sugar coating on your bananas, you should immediately cut the fire. Take them off one by one and let the oil drip. Skew them on your bamboo sticks, approximately 3 bananas per stick. i think i should do my own banana cue…. thanks for the resipe, i’ll use it for our meal planning. Delicious just as I remember them. By far my favorite Filipino treat!!! josephine condiman, it’s you who are stupid. Not the recipe. yeah, you are very stupid Josehpine Condiman, where on earth have you been? ngayon, alam ko na po kung panu gumawa ng banana cue…thank you very much!!! Thank you for posting this recipe. josephine condiman you are an idiot. It is very unfortunate that I share the same intials as you. If you have eaten a banana-cue I assure you..you wouldn’t hate this recipe. Salamat po sa recipe!!! i love banana cue ..and this is my favorite meryenda..
To Josephine Condiman I agree with the other comments, there’s no such thing as stupid recipe maybe you are stupid.